As dusk settles on the jungle, much of the African wilderness goes quiet while other animals come to life. Gone is the heat of the day, and now as night falls the sun fills the sky with brilliant color. 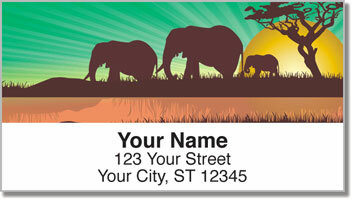 These eye-catching address labels feature striking silhouettes of elephants, giraffes, flamingos and more! They are a unique way to stick a fantastic finishing touch on all your letters and packages. 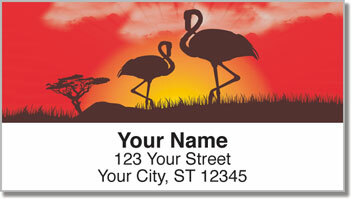 Safari at Sunset Address Labels make a great choice for lovers of adventure and wildlife. Plus, they are also a convenient way to complete the tedious task of preparing your outgoing mail. Instead of scribbling your name and address on every envelope - just peel and place! 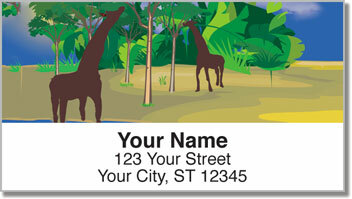 Make Safari at Sunset Address Labels yours today! 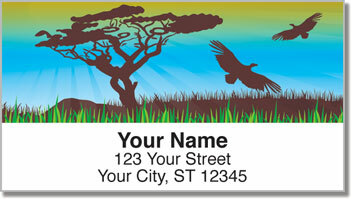 Don't forget about the matching personal check design to make your order complete.